Can cutting emissions save money? Can cutting emissions save money because cleaner air would lower rates of asthma and other health problems? If so, how great would the savings be compared to the costs of reducing carbon emissions? A research team from MIT examined three policies achieving the same reductions in emissions in the United States. They found that the health care savings as well as other lower costs associated with illness could be considerable – in some cases over ten times the money spent implementing a cleaner-air policy. The study, titled “A systems approach to evaluating the air quality co-benefits of US carbon policies“, and authored by Tammy M. Thompson, Sebastian Rausch, Rebecca K. Saari and Noelle E. Selin, has been published in the journal Nature Climate Change. All three were designed to resemble proposed US climate policies. The team found that savings resulting from fewer health problems in the population could recoup 26% of the cost to implement a transportation policy, and up to 10.5 times the cost of a cap-and-trade program implementation. As the savings due to fewer illnesses were similar in the three policies, the big difference was mainly in the costs of implementation. 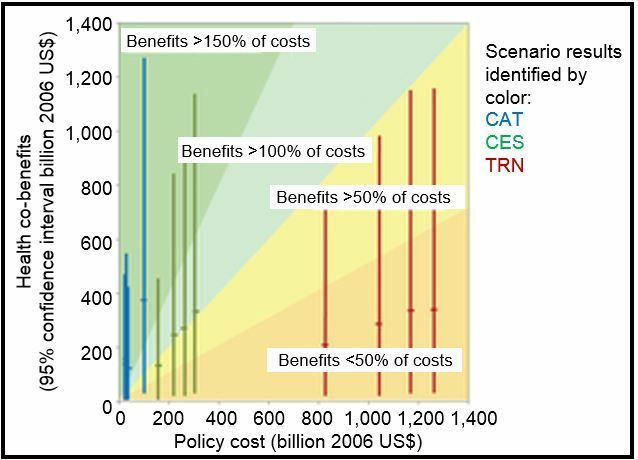 Policies targeting specific sources of air pollution, such as vehicles and power plants, did not lead to significantly larger benefits than cheaper policies, like cap-and-trade. The estimated $14 billion cost of implementing a cap-and-trade program is dwarfed by the savings from health benefits. A transportation policy would cost over $1 trillion (in 2006 dollars) to implement, while the health benefits would only recoup approximately one quarter of the cost. The cost of implementing a clean energy standard was between the costs of the other two policies, with the health benefits “edging out costs at $247 billion versus $208 billion,” the team wrote. Countries across the world have agreed to set CO2 emission limits. Companies that exceed their emissions cap either have to pay a penalty or purchase leftover allowances from businesses with low emissions.